Sean's guests include soprano Louise Alder with pianist Sholto Kynoch and horn player Stef van Herten, conductor and harpsichordist Jeremie Rhorer, and flautist Ashley Solomon. Soprano Louise Alder performs in the studio with pianist Sholto Kynoch and French horn player Stef van Herten ahead of their recital at Oxford Lieder Festival. Conductor, harpsichordist, and composer Jeremie Rhorer speaks to Sean Rafferty; he's conducting the London Philharmonic's performance of Carmina Burana at the Royal Festival Hall, in which Louise Alder is a soloist. 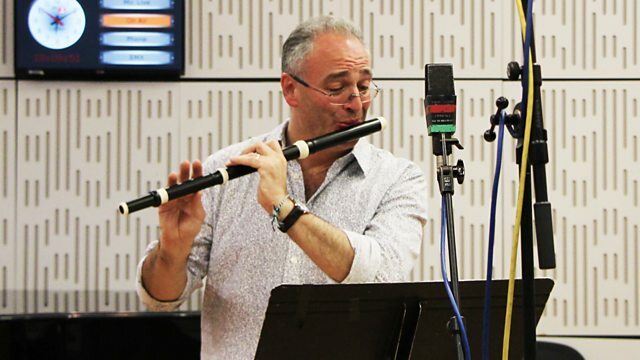 Flautist Ashley Solomon, who is leading the Two Moors Festival's Church Crawl with recitals of Telemann and Bach, performs live in the studio. Performer: Sholto Kynoch. Performer: Louise Alder. Orchestra: Scottish Chamber Orchestra. Conductor: Robin Ticciati. Performer: Louise Alder. Performer: Sholto Kynoch. Choir: Tanglewood Festival Chorus. Orchestra: Boston Symphony Orchestra. Conductor: Seiji Ozawa. La Clemenza di Tito, k. 621, act i scenes 11-12: no. 12, Quintetto con coro "deh Conservate, Oh Dei"
Orchestra: Le Cercle de l'Harmonie. Conductor: Jérémie Rhorer. Performer: Clara Novakova. Performer: Richard Vieille. Orchestra: Ensemble Orchestral de Paris. Conductor: Jean‐Jacques Kantorow. Saint-Saens: La Muse et le Poete etc: Kantorow. Performer: Stephen Coombs. Performer: Artur Pizarro. Darius Milhaud - Music for Two Pianos. Performer: Sir András Schiff. Orchestra: Chamber Orchestra of Europe. Director: Sir András Schiff. Piano Masterworks The World's Favourite Piano Classics. Orchestra: Royal Liverpool Philharmonic Orchestra. Conductor: John Wilson. Made In Britain: Royal Liverpool Philharmonic, John Wilson. Singer: Elin Manahan Thomas. Ensemble: Florilegium. Director: Ashley Solomon. Orchestra: BBC Philharmonic. Conductor: Yan Pascal Tortelier. Boulanger: Faust Et Helene Etc. - Soloists/CBSC/BBC Phil./Tortelier. Performer: Nico Muhly. Performer: Angela Chan. Performer: 陳詠桐. Philip Glass / Nico Muhly. Bridge: Orchestral Works Vol.5: Hickox.